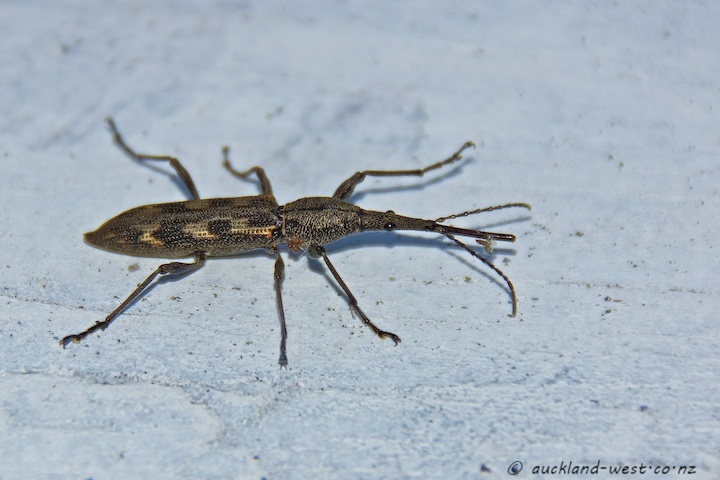 The other day I noticed this giraffe weevil (Lasiorhynchus barbicornis) marching across the freshly undercoated balustrade of our deck. This seems to be a female, about 40-50mm long; males have an even longer snout (rostrum is the term) and can reach 80mm or more. It’s the first time that I have seen one of these near our place. Kotuku reserve near Bethells Beach has trees infested with these creatures.